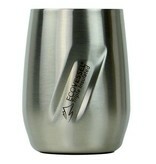 Take your favorite wine, whiskey, or cocktail on the go with the TriMax Triple Insulated Port Wine and Whiskey Tumbler. It's BPA free lid ensures your beverages will stay inside while sipping in the park or at your next concert. We've constructed the durable Port from food grade 18/8 stainless steel using our signature TriMax triple insulation to ensure your favorite drinks stay hot or cold for hours. The silicone base makes for a soft landing when putting it down and grips well to tables. The Port stemless wine glass has a sleek Scandinavian inspired design with a 3-dimensional design element and includes EcoVessel's 100 Year Warranty. No need to worry about breakage, it's the perfect condensation free alternative to traditional wine cups and whiskey glasses.